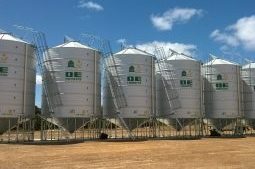 WA’s Leader in Grain Storage & Aeration. DE Engineers get ‘Top Score’ for silo sealing on Tammin farm by GRDC with new, improved lid closing mechanism to seal gas-tight every time. Store your grain in top condition, cool and dry while reducing insect infestation. 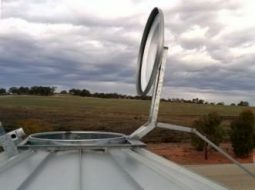 At Wagin Woolorama thi syear we were asked to design silos with wider openings for large auger hoppers and to raise the height of the outlet opening handle with a universal joint to stop sheep from operating the outlet. This will also allow auger hoppers to be raised higher under the silo to help prevent spillage. This is the proposed new design for 2019 2530 bushel or 76t silos. Our 3-86 tonne Silos are made from longer lasting hot dipped galvanised pipe with fully welded “Zincalume” base sheets (not riveted), steeper top and bottom cones, and are fitted with our unique, easy to use “Snap Tight” remote opening lid system. Not only can we boast the longest lasting silos made from more corrosive resistant material but we also use the thickest and strongest wall sheeting in the industry: Silos up to 86t capacity have 1.2mm thick wall sheet with larger silos having 1.5mm ‘spiral’ wall sheeting. Open the silo features PDF below for more information. 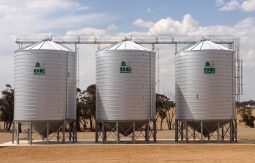 Meets and exceeds Australian standard AS2628 – Sealed grain storage silos. Not only do we use thicker material with up to 3 times the corrosion resistance, the ‘lock stem’ rivets we use in body construction have more shear strength (3.6kn) than self piercing rivets (3.57kn) used by some manufacturers. It’s not much but they are certainly better than ‘pop rivets’!! Our 152 tonne spiral silos have revolutionised grain storage in WA by being the largest fully sealed transportable grain silos in Australia. 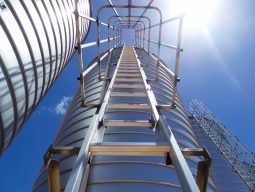 Many customers who have previously used rows of 76 tonne silos are now using larger silos, saving time and money. DE Engineers also manufacture 260 tonne site built spiral silos. The spiral silo has an extremely strong airtight wall system with smooth flat inside walls which is very important to avoid stagnation of dust and product (that usually form in the corrugated plates of larger bolt together silos). 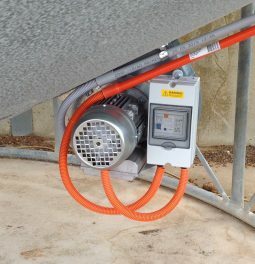 The absence of bolts on the silo shell prevents the formation of rust that forms on the bolt heads (extending to the panels) and help seal the silo gas tight without sealants. 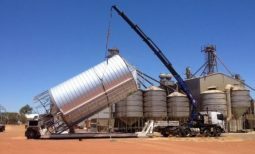 The biggest advantage in using the larger silos being: five 50 tonne road train loads can go in or out of the silo before the auger needs to be moved, greatly reducing handling. 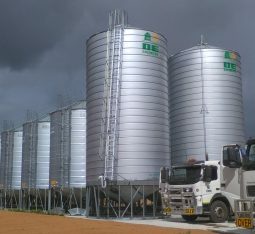 With the largest fleet of silo transport equipment in W.A. including 6 Prime Movers, two Bobtails, 4 large silos trailers and 4 single silo trailers. DE Engineers can transport up to 1000 tonnes of grain storage on the road in one move. 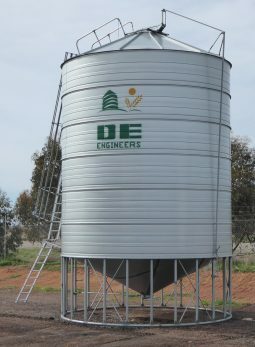 DE Engineers ‘extra long’ silo trailers can transport 2 x 92 cubic metre silos at a time making them the most cost effective silos for grain storage. Having ‘extra long’ trailers allows our silos to be made with steeper base and roof angles for better grain flow and more storage than our leading competitors for similar size silos. To deliver the huge 5 metre diameter spiral silos we have developed a completely new method of transport and installation. 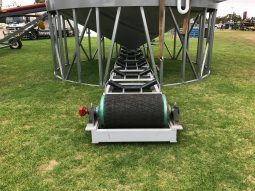 We have also developed a custom designed 200t/h, modular conveyor system for the massive 152t spiral silos which will allow operators to load trucks at the touch of a button while blending from multiple silos without the need to move augers. Innovation is what DE Engineers is renowned for. Even our safety cages are unique, being made in one piece for extra strength to reduce flexing and can be split down the middle and laid flat for transport. Lid systems have evolved but we have always tried to make them easy to operate sometimes with spring closing devices. While earlier lid systems were hard to maintain gas pressure our “snap tight’ lids are easy to use with just the right geometry to make them open and lock closed with the least amount of effort. Now we can guarantee all of our silos fully sealable with recent testing results equal to and in some cases better than our leading competitor. In Australia aeration will keep your grain cool, avoid spoiling and stop weevils hatching but fumigation is still necessary for immediate eradication if infested. This is why we offer you the best of both (fumigation and aeration). Many customers that are using aeration have eradicated weevil infestation completely by keeping stored grain cool and dry. See more information on our Aeration page.